Chatrium Hotels and Residences are situated in some of the most desirable locations in the region, from the pulsating metropolis that is modern day Bangkok to the captivating charm of exotic Yangon and unspoiled splendor of rural Chanthaburi. In fact, when it comes to the perfect locale for your perfect vacation experience it’s got to be Chatrium all the way. The owners and management of Chatrium Hotels and Residences are constantly aware and deeply appreciate how fortunate they are to be so successful and are wholly dedicated in giving back to the community and world Chatrium is lucky enough to share, which is why as part of the group’s Corporate Social Responsibility the “Think First, Think Earth” program was introduced. “Think First, Think Earth” is a property-wide program encompassing a number of CSR and green activities which benefit the local community and Earth as a whole and one recently held project was wholeheartedly embraced by a team from Chatrium Hotel Riverside Bangkok who gathered together to clean and tidy Wat Sutti Wararmam, a stunning Buddhist temple just down the road from the property. 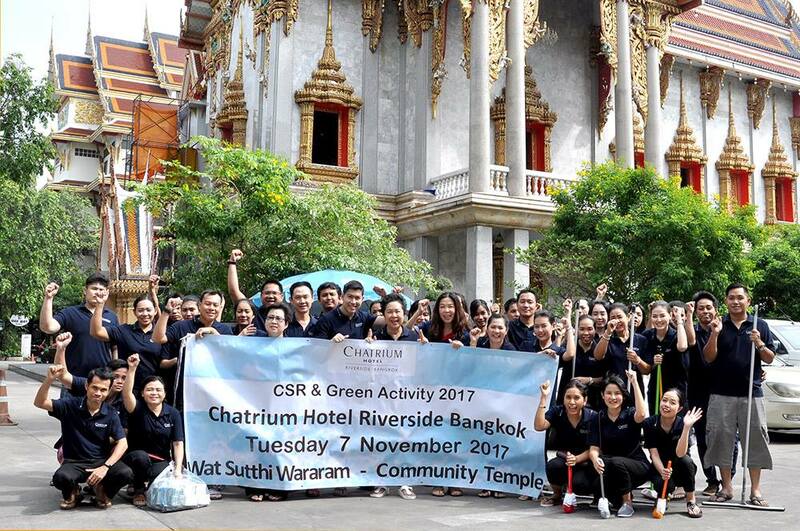 This was the 5th time in 2017 the hotel has visited the temple as part of the “CSR & Green Activity 2017” and will be the final time the team visits during this year. The Corporate Director of Human Resources of Chatrium Hotels and Residences Pariyarat Chunlakittiphan along with Resident Manager of Chatrium Hotel Riverside Bangkok Chatchawan Napawan donned their best cleaning clothes and armed with all manner of equipment led the hotel’s management and staff on a mission to turn the temple grounds into a spick and span place of worship. Chatrium Hotel Riverside Bangkok also donated in-house EM’s (Effective Microorganisms) to reduce wastage in the environment as well as presenting damaged towels from the property which could no longer be set in the guestrooms for the monks to reuse. So not only does Chatrium Hotels and Residences live up to its brand promise of “Live the Remarkable” but also lovingly takes care of our remarkable world and people as well. Previous PostPrevious It’s Dad’s Delicious Dim Sum Day of the Year at Silver Waves!